Get a 20% discount for Frontiers Health with Ticbiomed. See you in Berlin! This big event is a unique platform to learn, exchange and get inspired on the topics of digital disruption and technologies in healthcare. 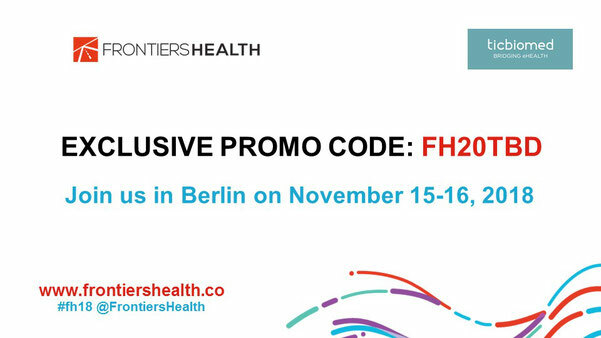 Frontiers Health 2018 will take place on November 15-16 at FUNKHAUS BERLIN. Get a 20% discount with Ticbiomed! The official hastag is #FH18 and you can follow Frontiers Health on Facebook , LinkedIn, Twitter and Vimeo. In addition, Frontiers Health will host two “Start-Up Discovery” sessions where selected companies will be present their innovative projects to a panel of renowned experts and top investors. Application will be open until September 30 and startups can apply here https://application.frontiershealth.co/. The Selection Committee will choose 10 companies that will be invited to be on stage at Frontiers Health 2018.